Clydesdales are large draught horses derived from farm horses of Clydesdale, Scotland. They were developed by the farmers of Lanarkshire, through which the River Clyde flows. The old name for Lanarkshire is Clydesdale. They were originally used for agriculture and hauling, and they still are used for draught purposes today. They have also been used to create and improve other draught breeds. They were bred to meet not only the agricultural needs of these farmers, but the demands of commerce for the coal fields of Lanarkshire and for all the types of heavy haulage on the streets of Glasgow. The breed soon acquired more than a local reputation, and in time, the breed spread throughout the whole of Scotland and northern England. In the late 19th and early 20th centuries, thousands of Clydesdales were exported from Scotland and sent throughout the world, including to Australia and New Zealand, where they became known as "the breed that built Australia". However, during World War I population numbers began to decline due to increasing mechanization and war conscription. This decline continued, and by the 1970s, the Rare Breeds Survival Trust considered the breed vulnerable to extinction. Population numbers have increased slightly in the intervening time, but they are still thought to be vulnerable. The original Clydesdales were one of the smaller breeds of draught horses, but now they are a tall breed. Clydesdales have gone through several changes of emphasis, over the years, to meet the demands of the times. In the 20's and 30's the demand was for a more compact horse; of late, it has been for taller horses. Most Clydesdales horses range in size from 16.2 to 18 hands and weigh between 1600 and 1800 lbs. Some of the mature stallions and geldings are taller and weigh up to 2200 lbs. With the changes in the size and type of horse wanted, the Clydesdale emphasis on underpinning has remained paramount. Clydesdale usually are colored bay, however, Black, brown, and chestnut are also seen with roans (solid body color with white hairs throughout the coat) in all of the colors. The preferred markings are four white socks to the knees and hocks, and a well-defined blaze or bald face. 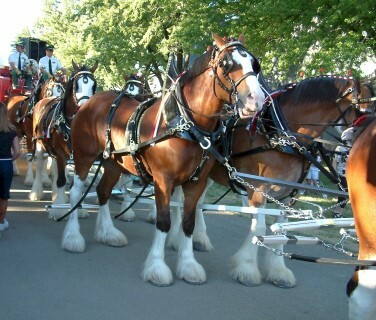 Some of the most famous members Clydesdale are the teams that make up the hitches of theBudweiser Clydesdales. TheBudweiser Clydesdales were first owned by theBudweiser Breweryat the end ofProhibition, and have since become an international symbol of both the breed and the brand. The Budweiser breeding program, with its strict standards of color and conformation, have influenced the look of the breed in the United States to the point that many people believe that Clydesdales are alwaysbaywithwhite markings.